I was born before I should’ve been! Where were the mercy seats in Anglo-Saxon England? Not invented, I'll have you know! No, indeed, monks in England could not rest their weary legs and blessed behinds until late in the thirteenth century, though some of their European brothers had their mercy seats a century earlier. Now I recently went to see some fifteenth-century (c.1440s) misericords up in England's Lake District. Well, I didn't purposely set out to see them. I don't have a misericord fetish, you know ... and certainly not one for monks' bottoms! What are you thinking! Anyhow, it just so happened that as I was visiting the rather splendid Cartmel Priory, I wandered into the choir stalls, the area of the church where Cartmel's Augustinian monks would have performed their liturgical services (before that nasty man Henry VIII had his wicked way with the monasteries). And there they were. I couldn't prevent a little outburst of envy. What I would have given for a little ledge upon which to perch my buttocks whilst singing my eight daily services: Matins, Lauds, Prime, Terce, Sext, None, Vespers and Compline! And don't get me started on High Mass for the whole community, and all those special masses for all the blessed benefactors. There was a lot of standing around in those days. But, I never grumbled. Now, if you want to know exactly what a misericord is, and how it functions, then take a look at my pictures. What you're actually looking at are hinged seats raised into the up position. This allowed the monks to stand and do their liturgical business, their prayers and singing. When not performing, monks got to sit on the full seat in its down position. If you're struggling to imagine this (God help you), the mercy seats are a bit like those new-fangled cinema seats of the twentieth century, only misericords are finely balanced so that they can remain up and down as desired. No dreadful swinging back up as soon as you stand up! On the underside of each seat, you can see the small, protruding ledge which is supported by a console. It was the consoles of misericords that received much attention by contemporary woodcarvers. Typical of British mercy seats, the Cartmel ones have tripartite carving schemes: a large central carving accompanied by, to the left and right, two smaller carved motifs, known as supporters. And what fascinating subject matter! Though I have heard that in some medieval churches a monk wouldn't have known where to put his blessed gaze, what with, shall we say, some of the rather more earthier designs in these houses of the Lord. I have been reliably informed that at St Mary's in Swine there is a 'Man lying prostrate, looking through his legs which are held up in the air'. Well, that's one way of putting it. Let's just say that's not the only thing this legs-a-kimbo fellow is getting up to. If you must see it (shame on you) click here. The designs at Cartmel Priory are generally a little more polite, even if not always obviously spiritual. I've included one here known locally as the 'Trinity Face', a crowned head with a triple face set in foliage (image 1). It may signify the Holy Trinity, though it has also been suggested that it represents a member of the mythical Macrobii, one of the marvellous, or monstrous, races of the East. Other mythical creatures find there way into the designs, including a griffin, a dragon with flapping wings (image 2), and a rather buxom, double-tailed mermaid (image 3). I wonder who sat on that one? There are plenty of depictions of real creatures, too, such as a deer being chased by dogs, feeding geese, an eagle in flight, and an elephant (paired, typically, with a castle). particular Christian symbolism attached to them, such as the peacock and the pelican, both of which in medieval art are associated with Christ himself. Sometimes it's difficult to determine what exactly is being represented. For example, is the figure in image 4 a mythical 'Green Man' with foliate facial outgrowth (the Green Man is usually seen as a Pagan symbol of rebirth), or is he just an ordinary chap with a rather dapper beard, like the fellow in image 5? Some of the designs might be read as representing popular public opinion of the time, such as the one of an ape holding a urine bottle. This may very well have served as a cynical comment about the medical profession, since the ape probably signified deceit, and the urine vessel was part of the medieval doctor's equipment. 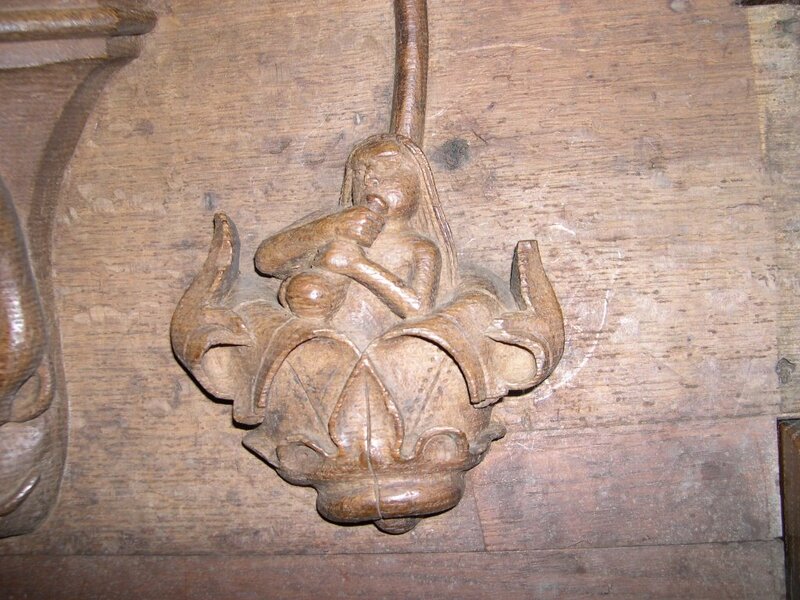 Clearly, there is much to think about when looking at the carvings on misericords, much to contemplate in terms of cultural meaning. Are we, for example, in the case of the more profane themes (of which I've largely spared you) simply looking at examples of medieval bawdy humour? Naughty carvers, or (God forbid) even naughtier monks and clerics?! Or is there even in the profane something didactic, something spiritual, perhaps serving to emphasize, by means of contrast, the importance of devotion? 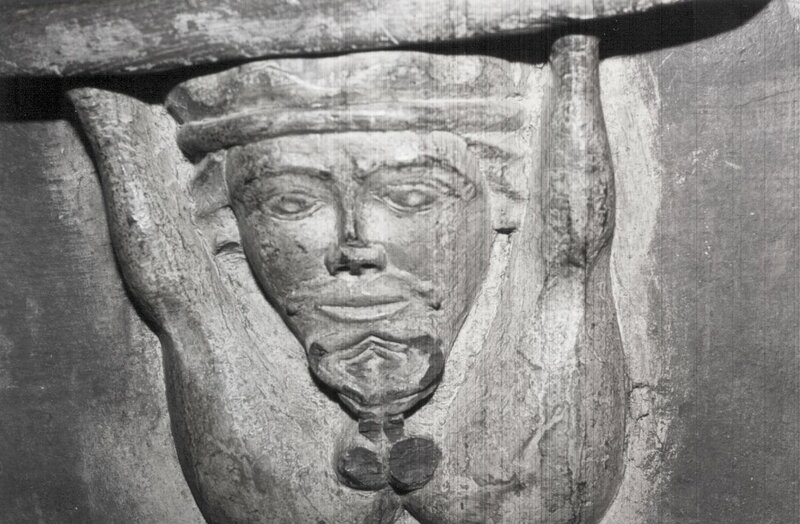 We should probably avoid thinking that everyone in the medieval congregation would have seen the carvings. After all, they were designed for monks' and clerics' bottoms, and probably for only their eyes, since these blessed ones performed their duties separated off from the laity. your examination of my own pristine example – monks and the like were educated men of God whose contemplative focus was the uncovering of God's will in this world. So, in other words, we monks have the capacity to see the spiritual in everything. For an excellent study of English misericords, see Paul Hardwick's English Medieval Misericords: The Margins of Meaning, published by Boydell Press (2011). You can purchase a copy of a booklet about the misericords at Cartmel Priory, written by Eric Rothwell, at the bookshop inside the priory. Go on ... you know you want to! The Anglo-Saxon Monk loves to hear your comments. Just follow the link below.